Ned Balbo's new book, The Trials of Edgar Poe and Other Poems, is a brave foray into the sometimes terrifying world of childhood. 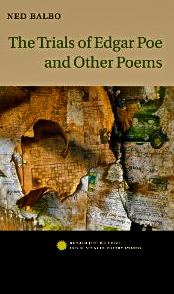 The collection, which won the Donald Justice Prize in 2010, consists of 25 well-wrought formal poems, each one substantial and some (such as, “Hart Island,” a powerful blank-verse narrative at the heart of the book) qualifying as tour-de-force in terms of their deeply imaginative engagement of the subject and the deftness of the poet's craft. In fact, this combination of grave content and lively formal wit characterizes the book as a whole, creating for the fortunate reader a world that is simultaneously haunting and high-spirited, woeful and playful. Childhood is common ground every one of us shares—our center of origin, a landscape of intense, relentless, and rapid change wherein our hopes and fears, loves and antipathies, talents and weaknesses have their genesis and generation. Within its precincts, for better or for worse, we become who we are. This shared terrain, and our seemingly inexhaustible interest in exploring it, is one reason for the enormous appeal of Balbo’s work, past and present. Readers familiar with his previous work, particularly his first book, Galileo’s Banquet (1998), will recognize this as territory the poet knows well and has probed with characteristic sensitivity and nuance. (It is worth noting that Balbo’s first book won the Towson University Prize for Literature and his second, Lives of the Sleepers, won the Ernest Sandeen Prize in Poetry in 2005, thus establishing The Trials of Edgar Poe as the third in a trifecta of prize-winning collections.) In his new book, Balbo approaches his theme from a fresh perspective—or, rather, a series of fresh perspectives—as he narrates the circumstances of his own difficult childhood intermingling them with the stories of others who have endured loss, insecurity, and disillusionment at a young age. Most prominent among the book's afflicted children is Edgar Poe, a figure Balbo identifies with as a fellow-poet whose artistic disposition is related to the sense of abandonment he experienced as a child. In addition, the poet is drawn to a host of motherless, fatherless, and otherwise vulnerable creatures, including the actual, the historical, the fictional, and the mythic. From Frankenstein’s “son” to Batman’s orphaned apprentice, Robin; from James Whale’s hunted “Invisible Man” to Jules Verne’s hapless young Harry; from Fanny Allan (Poe's foster mother and caretaker, herself an orphan) to Don O- (Balbo’s fatherless birth father)—and embracing even “the nameless dead” children buried by the thousands at Hart Island, New York City’s potter’s field—Balbo’s book gathers together a company of rejected, forgotten, and misbegotten souls whose identities and lives have been (de)formed and (mis)shaped by childhood circumstance. In the course of the book, childhood becomes a land of unlikeness that is also eerily familiar; thus, it should not surprise us when we find ourselves in these pages. I’d wait . . . It is telling that the poem—and the book—begins with the word “orphaned,” a term we understand to be used figuratively here, but one which will be literal for Edgar Poe, who becomes, in some measure, the narrator’s alter ego in future poems. Also, the boy’s presence in “a house not mine” adumbrates the sense of homelessness the narrator experiences, both as a child and, later, as a young man. (Once he discovers that he is adopted in an arrangement never legally finalized, his not knowing to whom he belongs leads to uncertainly regarding where he belongs.) Finally, it is worth noting that the narrator depicts himself in a characteristic attitude of helpless passivity: “I’d wait.” The powerlessness of children in the complex world of adults is a poignant, universal fact. This leads the narrator to share a strange affinity with the afflicted creatures who appear on the television screen: Boris Karloff’s and Lon Chaney, Jr’s portrayal of their monstrous selves draws his sympathy (“both would burn”), along with his fear, as creatures who do not belong. Thus, by the end of the poem and the final iteration of the refrain, we understand the narrator to be in search of these comforting companions of his childhood imagination who turn out, after all, to be much less frightening than real-life human beings. In this, and in subsequent poems throughout the collection, the powerlessness of childhood is set against the redemptive power of the imagination. Perhaps the central act of imagination, amid many, is the identification of the poet’s woes with those of Edgar Poe. Indeed, Poe haunts the volume, serving as both tutelary spirit and object lesson for what can happen to a poet when he loses his identity and becomes “the specter of his own fears.” In the course of three poems that focus on Poe, “The Trials of Edgar Poe,” “Adversities of Fatherhood,” and “A Year in Fordham Village,” the narrator rehearses the drama of Poe’s life: he is orphaned before the age of three, reluctantly fostered (but never legally adopted) by John Allan, and subsequently disowned. His brief marriage to his doomed cousin, young Virginia, ends tragically, as does his own life of quiet desperation soon after: “Poe in Baltimore would find his grave,” the narrator concludes, a chilling line which further underscores the poet’s identification with Poe as Balbo lives in the city where Poe died. Though these circumstances differ substantially from those of the poet’s life, they provide him with an alternate means to explore the fears and insecurities all children feel, to some extent. Yet, it is the mark of Balbo’s generous imagination that even as he depicts these men as seeming villains, he also acknowledges their humanity. For instance, we learn that Don O- was also a fatherless child, a circumstance Balbo explores movingly in the subsequent poem in the volume, “Ward of St. Teresa,” in which Don remembers his widowed mother visiting him in an orphans’ asylum when he was a child. Here, again, we see a child powerless in the face of rough circumstance, starved for love he cannot have and for security he cannot know. This radical vulnerability is yet another echo of Poe’s, the poet’s, and our own. The bitter-sweet quality of the son’s recollection is further confirmed by the musicality of these lines, a quality much evident in Balbo’s verse. The careful attention to rhythm and to the sonic patterns created by assonance, consonance, alliteration, and internal rhyme create a consoling effect, even as the poet tacitly acknowledges his grief at his father’s absence. over the cars of 27A. The absolute attention to the ritual of shaving is echoed by the careful orchestration of sound in this stanza—the rich internal rhyming of “chin” and “skin,” “white” and “sunlight,” in addition to the rhymes at the end of the lines—suggest the son’s total absorption in his twin tasks as caretaker and as poet. In some essential way, his two identities are fused, have become one. In addition, the poem depicts the conscious act of memory, wherein we hold fast to the concrete particulars of our lived experience with those we have loved in effort to retain some essential aspects of who they are—and were—to us. As the poem continues, the talk turns, as it will between fathers and sons, to baseball and to the Yankee Clipper. The narrator reads aloud the revelations of Newsweek that the recently-deceased DiMaggio was “an s.o.b.” In the final line of the poem, Carmine counters the attempt to denigrate his hero’s quiet greatness with this homely assertion of faith, “No one could fill his shoes”—a line which expresses the son’s unspoken admiration of his own childhood hero, his father. In “The Yankee Clipper,” heroes coalesce, even as the poem crystallizes a single moment in time and the relationship of a lifetime. The Trials of Edgar Poe begins with childhood and ends in adulthood, the arc of its narrative tracing the process of maturation we all inevitably undergo. Balbo’s poems evoke a series of powerful moments that are both past and, yet, somehow, present and ongoing, reminding us of the formative power childhood continues to exert on us through the agency of memory and of art. The poems also demonstrate poignantly the degree to which the adult one is now is rooted in the child one was then. These poems return the poet, and us, repeatedly to the ground of our making, enabling us all to re-cover who we were and to dis-cover who we have become. Angela Alaimo O'Donnell teaches English at Fordham University in New York City and is associate director of Fordham's Curran Center for American Catholic Studies. Her books include two chapbooks, Mine (Finishing Line Press, 2007) and Waiting for Ecstasy (Franciscan University Press, 2009), and two full-length collections, Moving House (Word Press, 2009) and Saint Sinatra & Other Poems (Word Press, 2011).